Fog003 · Awesome Downtown Playa 1BR! Sleeps 3!! Our building in the heart of Playa Del Carmen is perfect for your Playa Del Carmen trip! Location, location, location! We are walking distance away from the Riviera Maya beaches with it’s blue skies, swaying palm trees, and turquoise Caribbean waters. 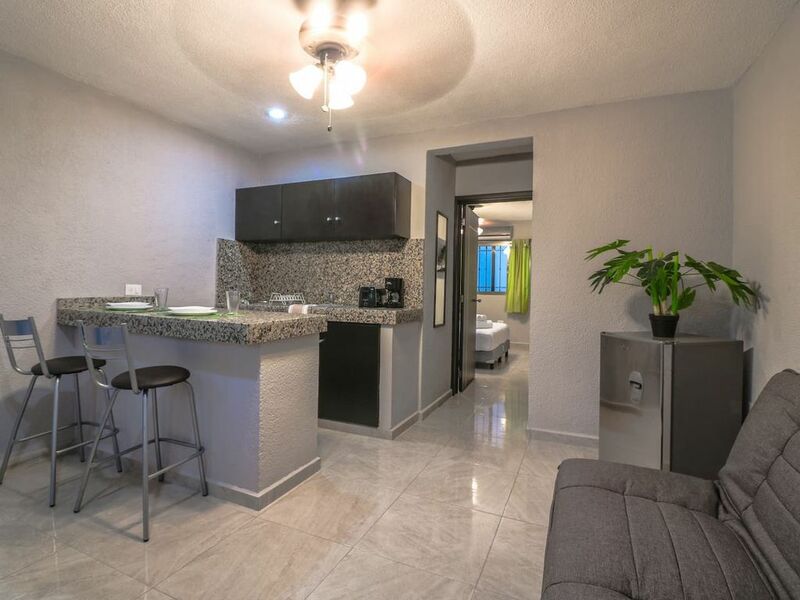 Centrally located, we are minutes to Playa’s popular La Quinta strip with nightlife, restaurants, and shopping. We have everything you need for a great stay including WiFi and A/C. Our building is centrally located in Playa Del Carmen, within walking distance to all the major tourist attractions. Relax. Explore the famous beach clubs or just lounge about on the beaches just blocks away. Or take a stroll down La Quinta strip, where you can find nightlife, restaurants, and shopping. This listing is for a 1BR complete with en suite bathroom and full kitchen. Our building is fully furnished and very comfortable. The kitchen is stocked with everything you'll need: appliances, cookware, dishes, etc. Our building is professionally cleaned before every stay, and comes with clean linens, towels, soaps, and everything else you'll need for a comfortable stay. This is a rental for the entire home, including the common areas of the building. Except for the common areas, you will not be sharing it with anyone and you will have access to everything in the home. You will receive an email shortly after booking on how to check-in, including Wi-Fi and all other pertinent details. To respect your privacy we will not bother you after check-in unless you need us. Feel free to reach out to us at anytime if you have any questions. The neighborhood is safe, but remember this is Mexico, and it's important to keep doors locked when not at home or sleeping. There are taxis that are waiting outside many popular establishments. Uber has just been approved, but it will likely take awhile before rides are widely available. Most of what you want to see in Playa Centro (Downtown) is within walking distance. If you want to rent a car, there is parking in the driveway. Electricity costs are extremely high in Mexico. Included in the rate is a credit of 22 kWh(Kilowatt Hour) per day towards the cost of electricity. The credit allotted is normally sufficient for a normal user. For heavy use, any additional consumption beyond the allotment will be charged at a rate of 6 pesos (about 35 cents usd) per Kwh. Turning off the air conditioners when out enjoying Playa is usually enough to stay within the allotment. 1. Payment- You “submit a booking” which means you pay the full amount now. We do not get paid until after your arrival. There are no cash transactions, and unfortunately you may not put down a deposit. 2. Deposit - Airbnb does not charge the deposit at all unless there is a claim for damages after check-out. 3. Unfortunately, we don’t have more pictures of the house and are unable to send you any more. 4. The site blocks telephone numbers until you have booked your trip, so we are unable to call you. 5. For safety concerns, we have disabled the ice maker and do not recommend drinking the tap water. There are convenience stores nearby that will sell you purified ice and water.